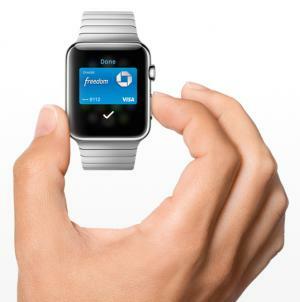 Will Apple Watch Drive Adoption for Payments Wearables? | NFC Times – Near Field Communication and all contactless technology. Apple Watch could pave the way for more payments wearables, though some critics charge the device is too closely tied to the iPhone. Users of the new watch, due out in early 2015, will be able to tap to pay with bank issued applications, just as they can with the iPhone 6 and iPhone 6 Plus starting this month. With the watch, Apple could add a big boost to what is only a small glimmer of a market so far for payments wearables. The market includes payments in wearables from PayPal, LevelUp and such strong contactless-payments backers as Barclaycard in the UK and CaixaBank in Spain. Of course, the concept of payments wearables has been around for years, most often in the form of promotional wristbands embedded with contactless chips that could be used for low-value payments, usually at special events, such as festivals. There has also been the occasional contactless chip embedded in watches for transit fare collection, such as one supporting the popular Octopus scheme in Hong Kong. Article has about 2610 words.